Wise Memory Optimizer is a free memory optimization tool. With the exclusive memory defrag technology, it can help you clean up memory, thus making the applications run faster. Most PC users have known and unknown applications running in the background that take up your computer’s physical memory and thereby affect its performance. Wise Memory Optimizer helps you free up and tune up the physical memory taken up by some useless applications to boost PC performance. Free Up And Tune Up Memory Taken Up By Useless Applications. Wise Memory Optimizer automatically calculates and displays the used, free and total memory of your computer upon deployment, along with a pie chart. You can learn your PC memory usage at a glance. 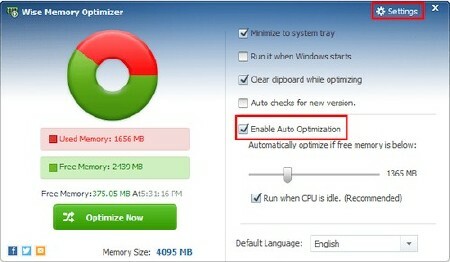 Single click the "Optimize Now" button, the program can free up memory in several seconds. This intuitive user interface makes it really easy to use for both novices and experts alike.